In 1915, the Young Turks, last representatives of the nearly faded Ottoman reality, decided to eradicate Armenian people. Armenians were Catholic and they stood out for being sharp in business and entrepreneurship, therefore becoming a centre of alternative power to central government: a sort of lobby, as we call it nowadays, a rich and united one. In a meticulous strategy, similar to the one used thirty years later in the extermination of Jewish people by the Nazi (we could say that Hitler himself ‘drew inspiration’ from the Turks to plan the Holocaust), the Turkish army laid siege to cities and villages mainly populated by Armenians and mercilessly killed men, women and children. All calls for intervention to the other Western Catholic nations had no answer: the focus on the First World War and a general and cynic indifference towards the destiny of Armenians did not save them from their Holocaust. Only a few of them managed to escape and start a new life abroad. Nevertheless, the horror they had experienced could not be forgotten and a sort of ancestral fear of Turkish people never left their heart. On the other hand, the Turkish, never acknowledged the atrocity that they had committed, even less a genocide: there were no media or photographs to prove that. Slowly all traces of the Armenian genocide faded. Atom Egoyan, a Canadian director of Armenian origin is the grandson of a survivor. He heard about these stories in his childhood and, when he started working as a film director, twenty years ago, he hoped to be able, one day, to turn these tragic tales into a motion picture. After several films, experimental at first, then more mainstream, his chance finally arrived. 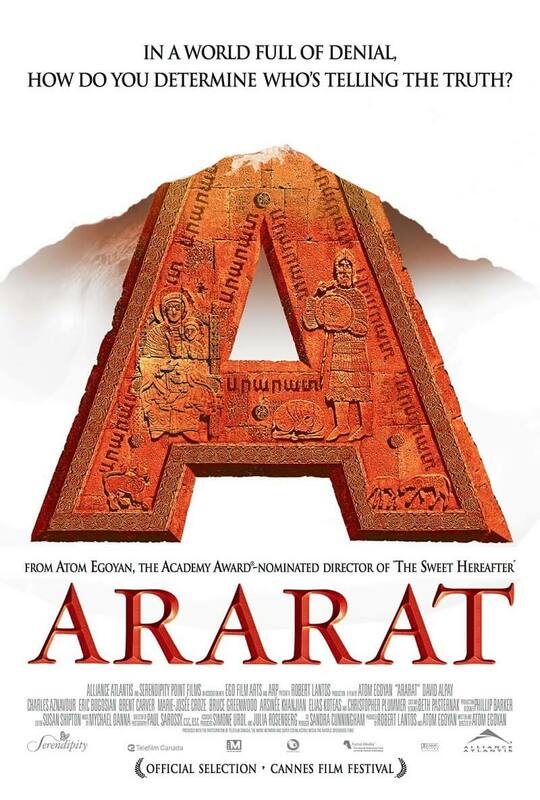 Ararat is his homage to the defeated people’s History, to the little daily events that, once put together, form the ‘great river’ of events and that are not recounted in books. He honors a population to whom any ancestral tie has been torn off; this population still doesn’t have a fatherland and lives in a sort of dull resignation. Egoyan is conscious of the fact that he cannot tell these events from his experience so he chooses to make ‘a film inside the film’: the main character of the film is his alter-ego, a Canadian director of Armenian origin who decides to make a film about the vicissitudes of Gorki’s family. Gorki is an Armenian painter who lost his mother during the Holocaust and left a portrait oh him and her as a spiritual testament. In order to be realistic, the scriptwriter relies on the advice of one of Gorki’s scholars, of Armenian origin herself; the woman faces this subject with delight, in spite of all her big personal problems due to a double widowhood and the difficult relationship with her son (he is engaged with his half-sister who accuses the scholar of being responsible of her father’s death). The director develops such an interest in the story that he goes back to Turkey and films the places of the Holocaust himself, as a homage to his father who had been an Armenian terrorist killed by secret service. On his way back from Turkey, he’s held up in customs by an officer who proves that, in the reels, there are not only films but also a drug haul; later on, the officer will let the boy free, maybe because he feels guilty for the problems he has with his son who has an homosexual relationship with one of the actors playing in the film. The plot is really articulated…for this reason, it’s quite obvious that there are too many irons in the fire. We should say that there are too many to allow Egoyan a straightforward development of the events and to give him the opportunity to follow all the characters’ adventures. Even if this is the main flaw of the film, we must acknowledge that Egoyan shows a laudable neutrality from the subject which allows him to build up an absorbing film, where private and historical tragedies overlap and end up to efface one another and where the ashes of a past that cannot be forgotten keep on burning. Memories to recover, the need to find a meaning to life, family ties seen as a cause of mourning instead of a source of joy: these are the main themes of the film and Egoyan balances them in a miraculous way without exaggerating with sentimentalities out of place, but, on the contrary, chilling emotions with his customary coolness. An anti-spectacular film, not perfectly successful nor well made but absolutely a must.